Eight foods cause ninety percent of food allergies: nuts, eggs, milk, soy, sesame seeds, wheat, fish and shellfish. If you suffer from some form of food allergy, are intolerant to soy or wheat or have to cook for a sufferer – here’s the book for you. “185 easy and delicious allergy-safe recipes” is the book’s subtitle and that’s exactly what you can expect. No glossy pictures, superfluous waffle, just plain and straightforward advice from a mother who was driven to write this book because of her children’s allergies. Son Samuel has a life-threatening egg allergy and daughter Emily can’t have soy and some nuts, so the author, nurse and midwife Suzanna Paxton had to completely change the family’s eating habits. Over the years and with the help of her understanding community and sympathetic friends and family she’s collected lots of safe recipes the whole family can enjoy. Now she’s sharing this wealth with sufferers as well as everyone else who is likely to cook for people with allergies. The recipes range from old favourites like fish cakes, shepherd’s pie and plain scones to tucker with a twist, such as fruity lamb stir fry, soy-free stuffed sausages and semolina berry cake. Every recipe is coded NF = nut free, EF = egg free, DF = dairy free, SF = soy free, GF = gluten free, WF = wheat free, FF = fish/shellfish free, SSF = sesame-seed free and V = vegetarian, so readers can see pretty quickly if the recipe is suitable. The book presents a range of helpful tips for allergy sufferers, such as the chapter on snack and lunch box ideas – both especially useful if you have to cook for kids with allergies. Paxton’s chapter on allergy management is short and incredibly easy to follow: Each of the above-mentioned allergens has a separate section, listing alternative names, substitutes and common foods that may contain the allergen. Did you know, for example, that TVP means textured vegetable protein and is an alternative name for a soy product? Or that you can use mashed banana instead of eggs as a binder in some cakes? Or that you can make your own gluten-free self-raising flour? Or that wine might contain egg? If this book was written for New Zealanders, the crowning glory would have been the allergy-safe shopping guide. But because it’s an Aussie book, many products listed in the shopping guide are only available in Australia. However, the guide is still useful because products, such as the Kraft Classic Italian Dressing and San Remo Gluten Free pasta, are available here in New Zealand as well. 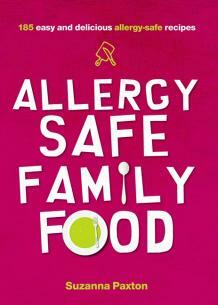 Good marks for lots of delicious, uncomplicated recipes and a simple guide to living with food allergies.